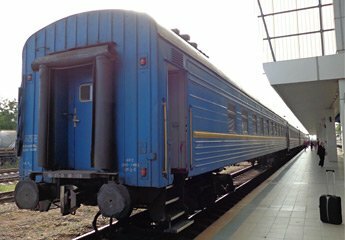 This page explains how to travel by train from the UK via Munich and Bucharest to Chisinau in Moldova. CFM (Calea Ferata din Moldova), www.railway.md. To check train times in Moldova & from Moldova to other ex-Soviet states, see www.poezda.net. Eurostar times & fares. All European train times: http://bahn.hafas.de. From 1 January 2007, UK, EU & US citizens no longer need any visa to enter Moldova. UK & EU citizens do not need a visa to enter Romania. You can travel to Chişinău, the capital of Moldova, via Bucharest. Step 1, travel from London to Bucharest via Paris, Munich & Budapest, as shown on the London to Romania page. The journey takes less than 48 hours by train. Step 2, travel overnight from Bucharest to Chişinău on the Prietenia sleeper train, leaving Bucharest Gara de Nord at 19:15, calling at Ungheni (the Moldovan frontier) from 04:43 until 06:45 and arriving at Chişinău at 09:03. 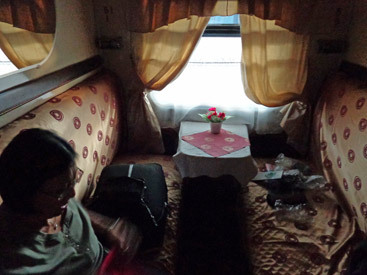 The Prietenia has 4-berth 2nd class sleepers, and 1st class 2-berth sleepers. There is a bar car selling snacks and drinks, but no restaurant, so take your own provisions along. This train currently runs every day - you can check this at www.bahn.de/en. Update: This train should run every day, but it reduced to running twice a week in mid-2017. However, it should now be running daily again. Travel overnight from Chişinău to Bucharest on the Prietenia sleeper train, leaving Chişinău at 16:56, calling at Ungheni (Moldovan frontier) from 18:43 until 20:23, and arriving at Bucharest Gara de Nord at 06:07 next morning. The Prietenia has 4-berth 2nd class sleepers and 1st class 2-berth sleepers. This train is currently running every day - you can check this at www.bahn.de/en. Travel from Bucharest to London as shown on the London to Romania page. Bucharest to Chişinău costs only 134 Romanian Lei (around €25) one-way at standard tariff in a 2nd class 4-berth sleeper, around 155 Lei (about €34) in 2-berth sleeper or 282 Lei (€€61) in a single-bed sleeper all to yourself. Booked in advance online, you may find special fares for a bed in a 4-bed sleeper from just 89 Lei (€19). Chişinău to Bucharest costs around 1120 Leu (around €50) per person in a 1st class 2-berth sleeper or around 560 Leu (around €25) per person in a 2nd class 4-berth sleeper. For fares from London to Romania see the London to Romania page. 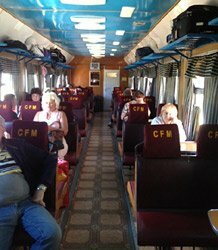 For an explanation of how to book trains from London to Bucharest, see the London to Romania page. Option 2, it can also be booked at the Moldovan Railways website on.railway.md:10000/?lang=en. Alternatively, you can book the Bucharest to Chişinău train at the international booking office at Bucharest Nord station as there are almost always plenty of places available even on the day. A 1st class 2-berth compartment on the Prietenia. Photo courtesy of Malcolm B. 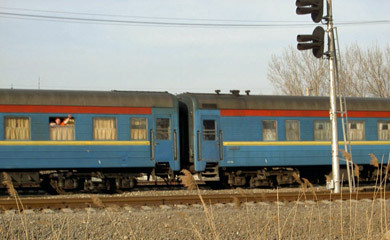 The Prietenia sleeper train from Bucharest to Chişinău. Photos above and right are courtesy of Pieter Beelen. 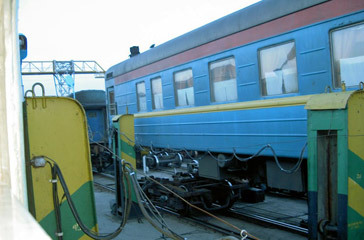 At the Romania-Moldovan frontier each sleeping-car is lifted on hydraulic jacks to have the bogies changed. You remain on board. Destination board. Photos courtesy of Peter Brogdale. Traveller Robert Hall reports: "The Romanian boarder was reached at 0400ish where our passports were taken away and scanned. The Moldovan’s are much more efficient and had a portable passport reading machine, although a second inspection resulted in ours being taken away again – I guess this is because our passports had a fair number of stamps and visa’s in them and they wanted to check them a bit more! The train was comfortable enough and bedding was provided. A pillow case, basic towel and two sheets were supplied in a plastic bag. In the space that went over the corridor from our compartment was a choice of either blankets or duvets. We had to make up the beds ourselves – no seats had to be taken apart. Whilst the gauge change itself at Ungheli went without issue/notice some of the shunting does not encourage sleep!" Traveller and group organiser Neil McDonald describes his party of sixty kilted Scotsmen knocking back the Moldovan champagne on the Prietenia : "I would describe the comfort as typical Soviet type comfort, although I enjoyed my journey on this service and indeed I intend using this service again. There were comments about bugs in some of the carriages but I never had any problems with my carriage. The Staff were a mixture of personalities, and with a party of 65 people spread over 6 carriages I got mixed reports about the stewards. Some (well most) were extremely friendly towards my group (almost all Kilted Scotsman) however some were grumpy and one steward seemed on the take. Most were very good with dealing with lost documentation and some of my group ended up sleeping in completely the wrong carriage without any problems. The train buffet was a very cheap and cheerful effort. I managed a small plate of chicken from the train buffet for the grand sum of 70p (it was soon sold out as word spread of the price through the train) and we discovered bottles of Moldovan Champagne going for £2.50 (have a guess how long that lasted too). Other items were going cheap as well." 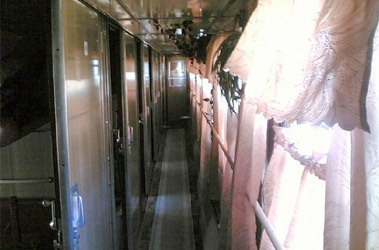 Above: The sleeper corridor on board the Prietenia. Photo courtesy of Jon Ethridge. Above: Chişinău railway station, Moldova. Photo courtesy of Jon Ethridge. There's another option. 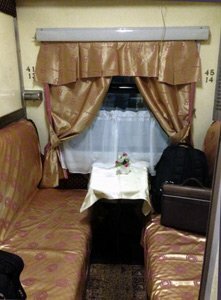 Why not travel from London via Berlin and Warsaw to Kiev, sleeper to Odessa, then use the Odessa to Chisinau train? See the UK to Ukraine page for travel options between London and Odessa. Train 641 leaves Odessa at 18:45 on Thursdays, Fridays, Saturdays & Sundays arriving Chişinău at 22:27. Buy tickets at the station. 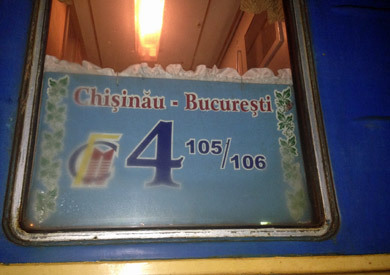 Train 642 leaves Chişinău at 06:57 on Thursdays, Fridays, Saturdays & Sundays and arrives Odessa at 10:46. 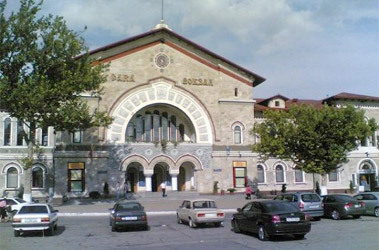 Buy tickets for the Odessa-Chişinău train at the station. Travel David Keating reports from a visit back in summer 2006, still relevant although much has changed since then: "I cannot foresee Chisinau becoming a tourist hotspot. It was from what one can see from old photographs once a very attractive city, but it was mostly flattened in WW2. There are one or two individual buildings of note still left, including a fine old station recently restored. It is a very green city with plenty of trees and parks. The central market is an excellent old fashioned food and general market which no longer exists in places like Poland. No one hassles you in Moldova, it's cheap to eat and drink though accommodation can be more pricey. At Orhei Vecchi there is an UNESCO heritage site comprising an unusual limestone cliff exposed by river erosion in which over the centuries mankind has burrowed, with many interesting remains. There are also half a dozen attractive monasteries. There is no where really to stay outside the capital, but the country can be reached usually on appalling roads in a day trip. The countryside is unspectacular otherwise, rolling landscape, greatly impoverished villages. There is a village by the river near Orhei, Trebushen, where an enterprising family provide pleasant accommodation with all meals and local wine at €30 per day per person. People do stay from all over the world, for example stray Japanese, Scandinavians, Italians and French. The village is not spoilt by modern buildings, there is walking to be done and otherwise pottering about. Some venture on the river. The family arrange collection of guests from Chisinau, which is about 40 km away. The place is desperately poor, and with the embargo placed on all imports by Russia the situation can only get worse. Over 80% of agricultural produce, wine etc was exported to Russia. Putin is putting the squeeze on to prevent Moldova following in the track of Ukraine. Transnistria, the breakaway enclave supported by Putin is a difficult place to visit. Tales come through of tourists having to pay for so-called visas etc. The rail link from Ukraine and Russia passes through Transnistria, as does the Russian gas supply, and the main power station providing over 80% of the electricity comes from there. When Stalin carved up the Romanian territory of Moldavia, he cut some off and gave it to Ukraine, in particular its coastal territory and took a piece of Ukraine and stuck it on. The heavy industry, military base, power stations were located on the other side of the Dniestr river in what had not been part of Romania. It is that chunk which holds many assets which together with a slice seized on the Romanian side of the river that comprises the breakaway enclave. The EU has declared it illegal and none of its henchmen can visit or pass through EU territory. It is a major conduit of arms made there, drugs, people trafficking, etc. This autumn the Russian embargo will really start to bite harder. More than a third of the population has left for greener pastures mostly as illegal workers in Portugal, Spain, Italy, the UK of course and here in Ireland. The ones that go are the young fit ones. In rural Moldova 80% of women between the ages of 16 and 36 are missing most of them forcibly taken into prostitution. It is a major scandal." You should take a good guidebook. 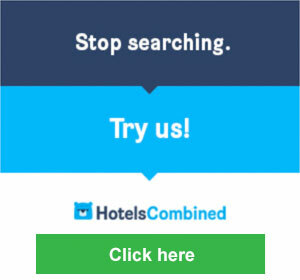 For the independent traveller, this means either the Lonely Planet or the Rough Guide. Both series are excellent. The Lonely Planet range offers an in-depth guide for Romania and Moldova or a guide covering all the countries in Eastern Europe. You won't regret buying one!